Citric Acid Electrode Cleaning Kit for the New LivingWater. A complete Citric Acid Cleaning Kit for annual electrode cleaning of the New LivingWater ionizer. Optional KDF filter for LivingWater Ionizer. The KDF would replace the #1 GAC cartridge that comes installed in the unit. Replacement filter should be replaced approximately after 10,000 Liters have passed through the filter according to individual source water conditions. Replacement Calcium filter for LivingWater. Installed in #2 spot. Replacement filter should be replaced approximately after 10,0000 liters have passed through the filter according to individual source water conditions. 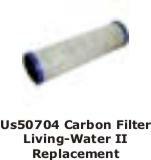 Replacement GAC (Carbon) filter for LivingWater. Installed in #1 spot. Replacement filter should be replaced approximately after 10,000 liters have passed though the filter according to individual source water conditions. Go to Air Purifier Shopping Cart Page"
Go to Springhouse Shopping Cart Page"